"Wait! What channel is that? Oh, never mind." Obviously, the TV set was a hand-me-down, but it didn't matter to us. We were newlyweds embarking on our exciting world together, so we didn't watch television except for General Conference; we stuck the set on a rolling cart and rolled it into the coat closet. but with the antenna broken off. Within a year, we had rolled the television out of the closet twice for non-Conference reasons: once on a tragic September Tuesday morning when a friend called to tell us to turn on the news, and another time when we wondered what was on prime time "now-a-days". Neither instance proved fruitful, so we got rid of the TV. Do you know what happens when you don't have a television? Everyone thinks you're poor! As soon as a friend, neighbor, relative, or ward member heard we did not have a television, they offered us a spare one they had stashed somewhere. 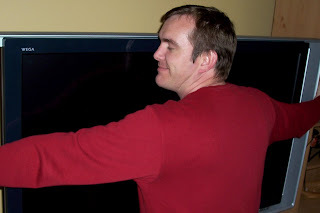 (Everybody seemed to have a "spare" TV.) After several offers, we finally accepted a 13" screen from my father-in-law. I want to say it had a 13" screen, but it may have been smaller. I am pretty sure there are cell phones today bigger than that television screen. 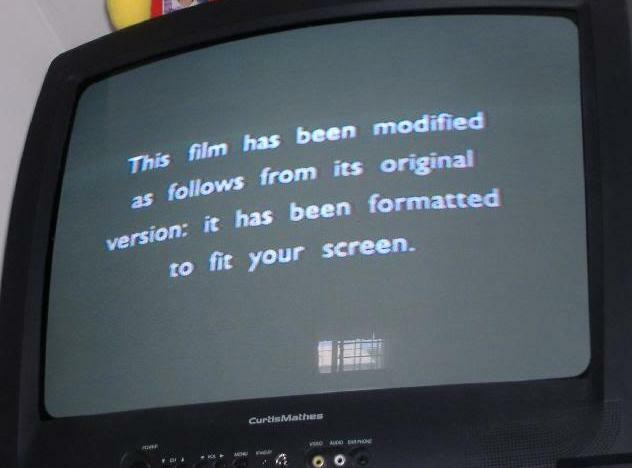 You know the notice that comes on your screen before a DVD movie begins? 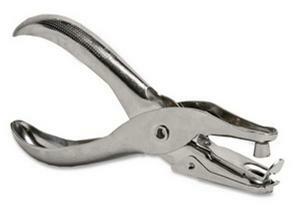 Whenever we were settled in our couch and that notice came on, my husband would make the clicking sound and hand gesture of someone applying a hole puncher to a filmstrip so the movie would fit our little screen. I will admit it was a lot of fun watching movies, conference, and television programs on it. But less than a year later, and me expecting our first child, I realized regardless of the size or resolution of the screen, there still wasn't really much worth watching on TV and not worth my time. I was also in the "nesting" phase, had realized how easy it would be to plop my child in front of the TV, and refused to make it simple for me to do that. I decided it was time for the thing to go. You should have seen the expressions on the faces of our home teachers, both ex-football players and big sports fans, the first time they came to our house after we sold the TV! The one from Texas came in, said hello, sat on our couch, and then let out a panicked "WHAT HAPPENED TO THE TV?!?" I laughed and laughed. Something tragic MUST have happened to it, right? Getting rid of such a big and beautiful television set was the first external sign in our lives that confirmed to everyone "Adhis is weird." It was no longer that we were poor. We were (are) weird. Have you ever chosen to do something good for your family, only to find that even your closest friends didn't "get" it? Or have you ever wanted to do something drastic to improve your situation but worried what the neighbors might think? There comes a time in life when one must decide for whom are they living life. Are you living a life that serves you and your purpose? Or are you living a life that serves others' opinions? When we sold that 50" television, I honestly thought we would buy a smaller set some time after the baby was born, but here we are, that baby almost 3 years old and my second baby cruising around the furniture. We don't really miss TV. Being without it has actually been refreshing; we are not bombarded by commercials, sloppy storylines, and sensational news coverage. I don't really feel like I am missing out on anything. Asides the obvious savings from reduced electricity costs and not paying for cable and television accessories, being TV-less has eliminated our impulse and media-influenced we-gotta-have/gotta-do purchases. Other perks: My husband and I are more aware of each other; we chat more. My kids play with us and each other more. The house is quiet, making time for rest or reflection easy to come by. It is loud when we choose music and dance. I hear the spontaneous little utterances of my baby discovering her voice. I catch the sweet moments when my toddler, who has speech delays, decides to ask me for something. These are experiences and relationships money cannot buy, and, interestingly, we have more money because we make space for them. These trade-offs make it easy for me to shrug off the are-you-crazy looks I get after I tell an acquaintance or a door-to-door cable salesman that we don't own a TV. I am not bothered when my internet provider's representative changes his tone of voice to you-poor-thing sympathy after I reject his attempt to upsell me to cable service by stating "we don't watch TV." Living without television has also increased my confidence in being "weird" in many other ways that benefit me and my little family. "We have to forego some good things in order to choose others that are better or best because they develop faith in the Lord Jesus Christ and strengthen our families." There are a lot of good and exciting options in this world. What "good" thing or habit will you exchange for something better? I'd like to say we still do not own a TV, but two weeks ago my dad moved, and knowing that we didn't own a TV, he offered us a little one he was leaving behind. I accepted. Currently, it sits in front of my treadmill, its purpose being to keep me walking longer. I haven't yet plugged it in or connected it to a DVD player. Eventually, I will. Probably. Every TV has an off button. I've had some neat experiences watching TV with my kids. And we still spend 99% of our time talking and playing and enjoying life together, in a quiet house. Good, better, best is an awesome way to look at our choices every day. (That's one of my favorite talks.) I love your post but please don't assume that all families who watch TV are making the "trade offs" you mentioned. It sounds like it is the best choice for your family but it is not for mine. Let's not judge each other. Kristen, she isn't judging you or anyone else. She made it pretty clear she was writing about the benefits our family has seen from not having a TV. She's not even suggesting it's the right thing for anyone else's family. I'm happy to hear that I misunderstood her intentions. I'm sorry. It's important that we not try to "keep up with the Joneses," but we also need to remember that the Joneses are probably good people too. That's all I meant by my comment and I see that we agree after all. Have you read "Amusing Ourselves to Death"? I just started reading it. Good stuff. Totally agree. 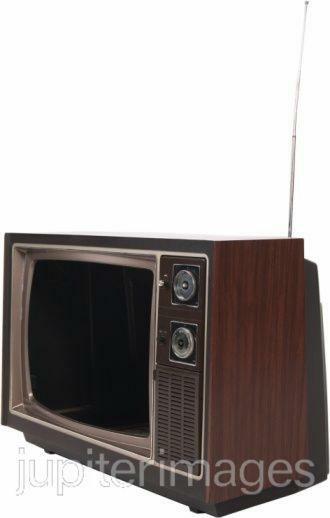 For years and years, we only had one TV and people were totally shocked by that. A few years ago we got TV #2. A few months ago we got cable. I hate having so many channels and just "surfing," but I love having DVR so I can watch shows when I want and I can skip commercials. More power to ya for no TV! Jeramy's roommate when we were dating didn't have a TV growing up and he was the smartest guy I've ever met!